Some time ago I made up a method for baking bread in the oven that has become my favourite. 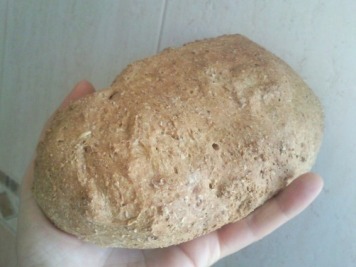 It's inspired in the "cloché" method (baking the bread under a clay 'bell' inside the oven). I have tried the 'bell' as well, and also the pyrex method...but using silicone is so convenient and practical... So here it is my tip: when you're ready to proof your dough, place inside a silicone mold with a lid (I use a mold for steaming fish or vegetables), proof either inside the halogen or where you want...and then bake in the halogen oven just like that, inside the silicone mold. You can check it say after 30 minutes, it won't hurt, the bread won't collapse. Time depends on the size of bread; usual temperature, maybe a little higher during the last 10 minutes. Quite surprisingly, the silicone method produces a crusty bread. I have resized the picture so that we can see it fully. However the slide video was creating some problems for the administration of the forum. Thank you very much for taking the time to share this with us. Thank you Reeta and Junie...I am contributing, but I am certainly learning a lot by reading posts in this forums.